Looking north-east from where I live, away from the Downs and instead to the ridge above Battle, there is a dark, imposing hump on the horizon. Not quite as striking as Firle Beacon to the south-west, its covering of dense woodland makes it an ominous prospect, nevertheless. However, Darwell Wood, an ancient broadleaved woodland between the villages of Netherfield to the south, and Mountfield to the north, is a different prospect up close. This privately-owned – but with public access - wood offers beautiful walks under a dense canopy of oak and hornbeam. A Site of Special Scientific Interest (SSSI), it is home to many species of breeding birds, including woodpeckers and nightjars. At this time of year there are displays of wild garlic and bluebells, and the paths are criss-crossed by many streams that flow into the Darwell Reservoir. But it is not just natural history that makes the wood a fascinating place. When the reservoir was created in 1949, Darwell Furnace Farm, along with a number of cottages, was consigned to an aqueous grave to supply water to Hastings. As the name of the farm suggests, this site had previously been part of the Wealden iron industry that was active from before the Roman invasion, peaked in Tudor times and finally declined in the 19th century, when it could not compete with the new Ironmasters of the Midlands and the North. However, Darwell Wood did not stop being part of Sussex’s industry. From 1876, the soft mineral, gypsum, was mined at Mountfield and, from the 1960s, at Brightling to the west. 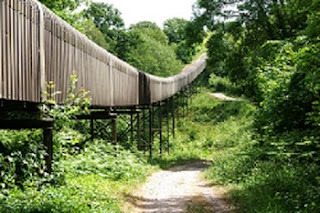 The sulphate was transported from Brightling, to the British Gypsum plant at Mountfield, by an overhead cableway that ran through the wood. In 1989, this was replaced by a covered conveyor belt that snakes three miles through the trees to this day. Mining ceased at Mountfield in 1993, but the Brightling mine is estimated to have at least another twenty years of life providing the raw materials for the cement and plasterboard industry, and employment for 130 people. The modern countryside very often seems to be the preserve of NIMBYs desperate to protect chocolate-box views and pastoral scenery without a thought for the infrastructure of jobs and services that ordinary people require. A few years ago, whilst walking in Somerset with friends, we came down from the Mendip Hills through Mells, a village replete with Range Rovers and Farrow and Ball paintwork, and stumbled upon the extensive remains of Fussells’ Victorian iron works in woodland on the banks of the river. It was hidden away - an embarrassment that was not part of the bucolic narrative – because rural industry, particularly in the south, is something that most like to pretend does not exist. But the countryside is not natural: it is a landscape shaped by people who have worked the land, over-ground and underground.